Is she a species of supernatural creature placed somewhere between humankind and the Divine? Is she an elemental creature? Is she and angel, a devil or a fallen Goddess? Is she willing to help humans or is she indifferent or even unkind to mortals? Where did she come from? Lewis Spence in British Fairy Origins equates Faeries with the dead and brings plenty of evidence to support his theory. The fairy knolls near churchyards were supposed to be the places where the soul of the dead lodged waiting to rejoin their bodies on the Day of Judgment. Their small size is accounted for by the primitive idea that the soul is a miniature replica of the person it's attached to. Ban Sidhs' are sometimes described as ghosts. A less common belief was that the faeries were actually humans, founded on the memory of a more primitive race driven into hiding by the invaders, lurking in caves or fens. Could the Faeries be a class of "demoted" angels? One popular story held that when the angels revolted, God ordered the gates shut; those still in heaven remained angels, those in hell became devils, and those caught in between became fairies. Others held that they had been thrown out of heaven, not being good enough, but they were not evil enough for hell. This may explain the tradition that they had to pay a "teind" or tithe to Hell. As fallen angels, though not quite devils, they could be seen as subject of the Devil. Another belief was the fairies were completely devilish. This belief became much more popular with the growth of Puritanism. The hobgoblin, once a friendly household spirit, became a wicked goblin. Dealing with fairies was in some cases considered a form of witchcraft and punished as such in this era. 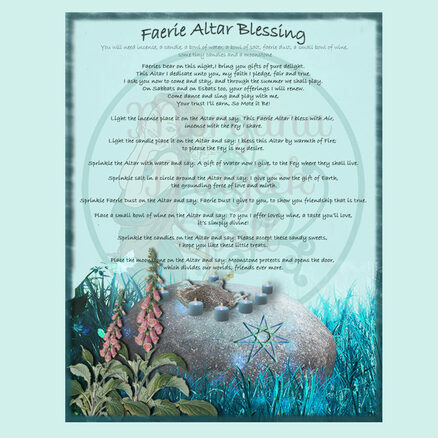 The last theory is that the faeries are dwindled gods or nature spirits.Many of the Irish tales of the Tuatha Dé Danann refer to these beings as fairies, though in more ancient times they were regarded as Goddesses and Gods. The Tuatha Dé were spoken of as having come from Islands in the north of the world, or, in other sources, from the sky. After being defeated in a series of battles with other Otherworldly beings, and then by the ancestors of the current Irish people, they were said to have withdrawn to the sídhe (fairy mounds), where they lived on in popular imagination as "fairies." "a procession of creatures of the size and color or green and gray grasshoppers, bearing a body laid out on a rose-leaf, which they buried with songs, and then disappeared." offered they'll take offense and never loan to you again. Nowadays the Fey Folk are looked upon as pretty and benevolent, we all want to believe that Faeries are lovely winged creatures that happily play and frolic in our gardens and forests spreading light, happiness and love to all. Unfortunately the Fey, like all creatures, are complex and intent on living their lives. All Faeries can be formidable, if not down right scary if they are injured or insulted. One must tread very carefully when dealing with them. Faerie folk have been divided into two different types by humans: Evil Faeries belong to the " Unseelie Court" and are never under any circumstances favorable to humans. 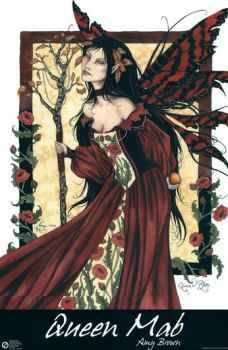 Good Faeries belong to the "Seelie Court" and are considered to be kindly towards humans and may give gifts of bread and seed corn to the poor and help with tasks. But even the Seelie Court Fey will readily avenge any injury or insult. Not all faeries have wings! Apparently faeries don't fly by means of their wings (if they have them), they instead "levitate" by using a magick password, or they fly through the air on transformed ragwort stems, twigs or bundles of grasses using them like witch's broomsticks. Green and red are the official Faerie colors. The Faerie lads may wear green coats with red caps or yellow breeches with blue coats and Faerie ladies may wear long green or blue dresses with red slippers. They by no means have a dress code however, and have been seen sporting fox furs, plaids, leaves and moss, flowers spangled with dew and gauze, lambskin, pheasant's feathers and topknots in their hair. They may also be completely naked as preferred by water-sprites and nymphs. The Fey had two types of faerie animals, the first type are wild animals that exist in their own right for their own purposes, the second are domesticated animals bred and used by the Fey. It's sometimes very difficult to distinguish between these two types because the Faeries often allow their animals to roam freely. Horses - Have the power to shape-shift and are used in Faerie Raids. Very ferocious and wild! Cattle - An Elf Bull was a welcome visitor to any mortal herd, but some Elf Bulls could be ferocious. Cats - Considered to be almost Faeries in themselves. Selkies - Seal people whose natural form is human and who live in an underwater world and put on seal skins so that they mas pass through the two worlds of water and air. Goats & Deer - Thought to possibly be the Fey in their true shape. Trout & Salmon - Considered to be Faerie creatures. Faerie Folk are known for capturing and stealing humans. 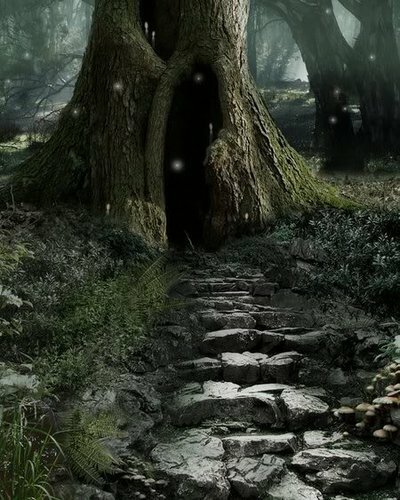 If a person ventured into a Faerie hill and was inveigled into tasting faerie food or drink they could remain captives. Sometimes the captives would be made into slaves, or they would be caught because of their beauty and talent to enrich the Faerie Tribe and to inject the dwindling stock with fresh blood and vigor. Nursing mothers were taken because human milk gives extra vigor to the more frail Faerie babies. Time in Faerie land can be tricky. A dance of a few moments may take a year and a day of common time, and a few days of feasting and merriment can consume more than 200 years in the mortal world. Occasionally both Faerie and mortal time can be in sync with each other but it's wise to know that if you visit Faerie land you run the risk of returning long after your mortal lifespan has been consumed. The Faeries have been known to steal an unchristened child out of the cradle and leave a substitute in it's place. The substitute could be a block of wood roughly shaped into the likeness of a child and "glamoured" with a temporary appearance of life which soon faded. When the baby would appear to die the substitute was duly buried. Sometimes a sickly Faerie child would be exchanged for a beautiful healthy human baby. Oftentimes the changeling was an old withered fairy of no more use the the Faerie tribe, who was willing to lead an easy life being fed, cherished and carried about by it's anxious foster-mother while it cried and wailed for food and attention. Stolen babies were fed on faerie food, loved and taken care of by Faerie mothers. They would eventually be accepted as full members of the Faeries tribe. Virtues esteemed by Faeries: They like humans to respect their privacy and guard against infringements upon their privacy, humans should be generous, speak the truth, open loving free people are dear to them (hate boasters and braggers) hospitality (specially towards Faeries), neatness and cleanliness of the houses and gardens they visit. Keeping of promises and fair dealing with all, merriment, cheerfulness, music, dancing. Dancing: All Fey love to dance and all are very good at it. Fern: Pixie fairies are especially fond of ferns. One story tells of a young woman who accidentally sat on a fern, and instantly a fairy man appeared and forced her to promise to watch over his fairy son and remain in fairyland for a year and a day. They are also used to make soft beds. Foxglove: The name "foxglove" came from the words "folk's glove." Folks referred to little people, or fairies. One legend says that fairies gave the blossoms to foxes to wear as gloves so they would not get caught raiding the chicken coop. 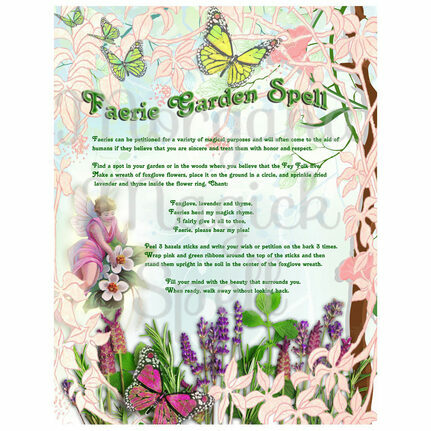 According to another legend, if you picked foxglove, you would offend the fairies. And if the fairies stole your baby, the juice of the foxglove would help to get it back. In some stories, foxglove appears as a fairy's hat, and the Fey like to make clothes of the flowers. .Ragwort, cabbage stalks, grass and straw: all of these were used by fairies for transportation in the same manner as a witch uses a broom. 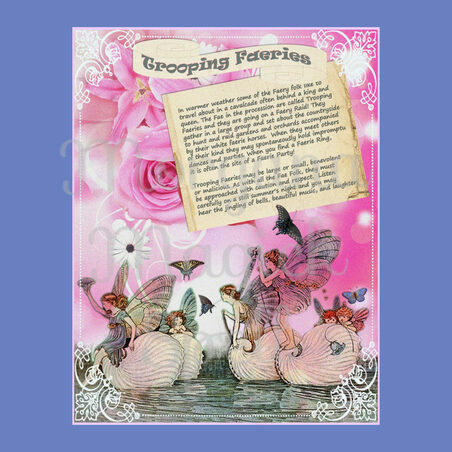 Tulips: Faeries like to use the tulip bloom to put their babies to bed. Stroke for a sudden paralytic seizure comes from the word fairy-stroke. It was believed that a person who suffered a stroke had been shot with an elf dart, their body stolen away and replaced with a transformed faerie. Rheumatism, slipped discs or anything that twisted or deformed the body was supposed to have been inflicted by Faeries pinching or hitting the afflicted person. Faeries like all wild creatures feel themselves to have a right to any human possession, particularly food. They are able to "take the goodness" out of food, that is take the substance out leaving the appearance of the food behind. This explains why faerie offerings of food and drink appear to remain intact and uneaten. It's important to remove the old food and replace it with new. Faerie Trees: Oak, ash and thorn, apple and hazel, rowan, holly and willow, elder and alder. "Faerie folks are in old oaks"
Oak - Bitterly resent being cut and an oak coppice which springs from the cut root, is said to be malevolent. Elm- If an Elm is cut down a neighboring elm will pine and die in sympathy. Willow- Said to be able to uproot themselves on a dark night and follow a solitary traveler. Elder - One must ask permission of and Elder tree before cutting a branch. Faeries sought protection under it's boughs. Ash - Gives protection from mischievous spirits, and tying an oak, ash and thorn branch together with red string will protect against night spirits. Faeries have their own code of morality and strictly enforce it. Untidiness - keep your hearth swept, your house tidy and your garden neat or you may be punished. Fill a crystal glass with water and leave it in the light of the Full Moon. Be sure to bring the glass in before it's touched with morning light. Cut three small twigs of Rowan tree, wash them in Moon Water and then pass them through incense smoke. On each twig, write or carve the name of the Faerie that you wish to summon. Bury the twigs near where you think Faeries may live. After 5 nights unearth the twigs, face East and call the Faerie. Fairies can only be seen clearly by animals and seldom by humans, although if one is fortunate enough, one might catch a fleeting glimpse when fairies use their power (known as 'glamour') to enable a human to see them. There are also certain means and certain times that the Fey can be caught unawares. A four leaf clover crushed and put into an ointment may give one sight of the Faeries as well as placing Faerie Ointment on the eyelids. Bending over and looking backwards through your legs, peering through a Fir knot hole, or a stone with a self-bored stone (a stone in which a hole has been made by tumbling in the waters of a brook; not found on a beach) or looking through a loop made with a Rowan twig may cause Faerie sight. The best times for seeing Faeries is twilight, midnight, noon and the hour before sunrise. The best day of the year is Midsummer Eve. Faeries can only be seen as long as you look at them steadily, if you look aside they will disappear. Also, during a full moon on Midsummer Eve you may be able to witness Faerie dances or celebrations. She wears dresses that glow with fiery colours and has multicoloured wings like a butterfly. 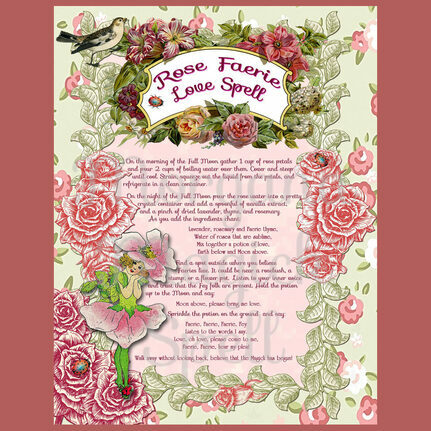 Place rose water, marygold flowers (gathered towards the East), hollyhock buds, thyme, buds of hazel, grass gathered near where faeries are known to live and some good quality oil such as avocado or grape seed,in a glass jar and steep in the sun for 3 days.